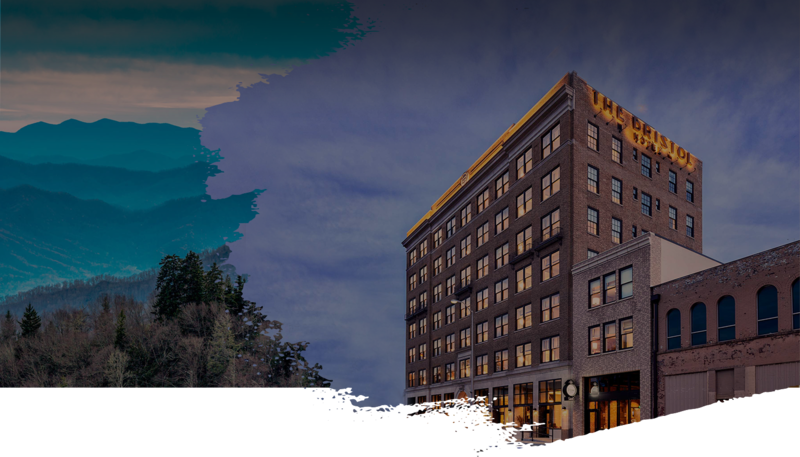 Our reimagined 65-room bou­tique hotel features a rooftop bar with sweeping views of the Appalachian Mountains, street-front dining with family style regional fare, and a historic ballroom for unforgettable social gatherings and special events. Come for the small batch brews and scratch-made regional fare, stay for the magnificent views of the Appalachian Mountains and bustling city center. Receive 10% off your stay as you discover why The Bristol Hotel was named one of USA Today's 10Best New Hotels in the U.S.
A block away from State Street, the state border between Virginia & Tennessee, this beautiful hotel has everything from a roof top lounge, fabulous dinning @ Vivians, very cozy comfortable rooms and a history to downtown Bristol VA. Perfect experience - great find! This is a great find on our way from DC to Nashville. Tucked away in Bristol, this new hotel is a gem. The service is 5 star, along with the accommodations and ambience. They could not have been more welcoming to our dog... and us! Great pet hotel.